seawapa.co: How Cancer Politics Have Kept You in the Dark Regarding Successful Alternatives. How Cancer Politics Have Kept You in the Dark Regarding Successful Alternatives. A powerful conglomerate of government agencies, international drug companies, and major cancer treatment hospitals puts profits first. They do not want the public to learn about and pursue effective alternatives. The result is that chemotherapy, radiation, and surgery are the law of the land as cancer treatments-for political, not therapeutic, reasons. Recent news has shown that the majority of studies geared towards cancer research are inaccurate and likely fraudulent by nature. Findings published in the journal Nature show that 88% of major studies on cancer that have been published in reputable journals over the years can not be reproduced to show their accuracy. This means that the research findings published are flat-out false. Most of what you have heard over your lifetime about cancer treatments is not the truth. At the very least, you have received an incomplete picture. If you believe the propaganda you have been fed and you develop cancer; it can cost you your life.In the United States, economic interests masquerade as therapeutic regimens and scientific concern. Their goal is to own and completely control a disease-cancer-as if it were a commodity, and to quash competition (meaning alternative approaches), so as to maintain a marketplace monopoly.Money leads politics by the nose. The financial interests of drug companies, conventional cancer doctors, hospitals, HMOs and others in what is known as the Cancer Establishment, have eclipsed the integrity of the Hippocratic Oath; money and politics have proclaimed conventional approaches as scientifically validated and therefore mandated by law. The terrible flaw in this convenient financial setup is that the profits that flow to the cancer establishment are derived from human lives lost to cancer because successful alternative approaches are outlawed or unreported.To the cancer establishment, a cancer patient is a profit center. The actual clinical and scientific evidence does not support the claims of the cancer industry. 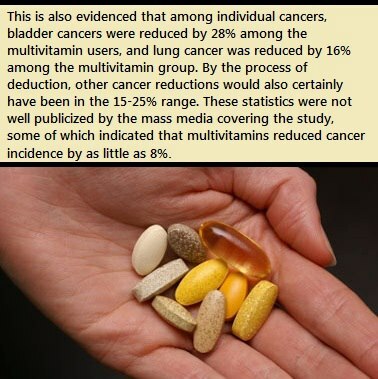 Conventional cancer treatments are in place as the law of the land because they pay, not heal, the best. Decades of the politics-of-cancer-as-usual have kept you from knowing this, and will continue to do so unless you wake up to their reality.Although rising cancer rates are bad news for patients, they are great news for the cancer treatment industry-Cancer, Inc., as some critics have labeled it. In this environment, words that sound scientific and doctorly often mask a different agenda. The phrase "treatment success" can mean profitable, while "dangerous" or "questionable" treatment can refer to therapies that threaten the profits of the cancer industry. When you begin to ferret out the economic context and motivations of cancer treatment, it helps you understand why alternative cancer therapies are suppressed or barred from the public's awareness. It helps you see why treatments as dangerous and consistently unsuccessful as radiation and chemotherapy continue to dominate the field of oncology.The reason alternative cancer treatments are not mainstream has little to do with alleged therapeutic ineffectiveness and far more to do with political control over the therapy marketplace. The politics of cancer have an overriding influence on the science of cancer and, ultimately, on what the public thinks and believes about cancer and what it is able to expect as treatment options. The doctors who perform cancer treatments and the scientists who conduct research are not the ones in control of the cancer field. It is the larger power structure of the cancer establishment that effectively controls the shape and direction of cancer prevention, diagnosis, and treatment.' 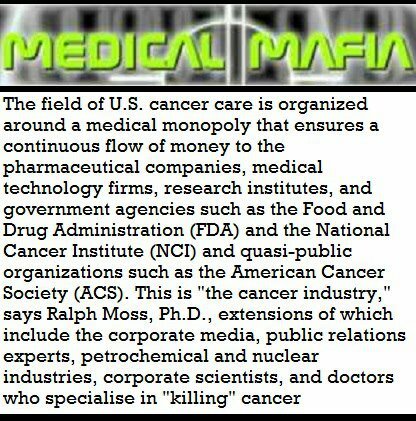 The field of U.S. cancer care is organized around a medical monopoly that ensures a continuous flow of money to the pharmaceutical companies, medical technology firms, research institutes, and government agencies such as the Food and Drug Administration (FDA) and the National Cancer Institute (NCI) and quasi-public organizations such as the American Cancer Society (ACS). This is "the cancer industry," says Ralph Moss, Ph.D., extensions of which include the corporate media, public relations experts, petrochemical and nuclear industries, corporate scientists, and doctors who specialize in "killing" cancer.Cancer research has been set up almost entirely in favor of conventional approaches ever since the war on cancer, formalized in 1971 as the National Cancer Act, was first scripted in the 1960s. At that time, Senator Ralph Yarborough (D-Texas) organized the National Panel of Consultants of the Conquest of Cancer Of its 26 members, 10 came from the American Cancer Society and 4 were affiliated with Memorial Sloan-Kettering Hospital; Benno Schmidt, M.D., the director of Memorial Sloan-Kettering's Cancer (Center was the panel's chairman, and Sidney Farber, M.D., former president of the ACS, was its vice chairman.